Assessment is the mechanism used to measure progress in learning over a given period of time. The methods of assessment should be both valid and reliable to enable an accurate measurement of understanding, application, analysis, evaluation and synthesis of knowledge. 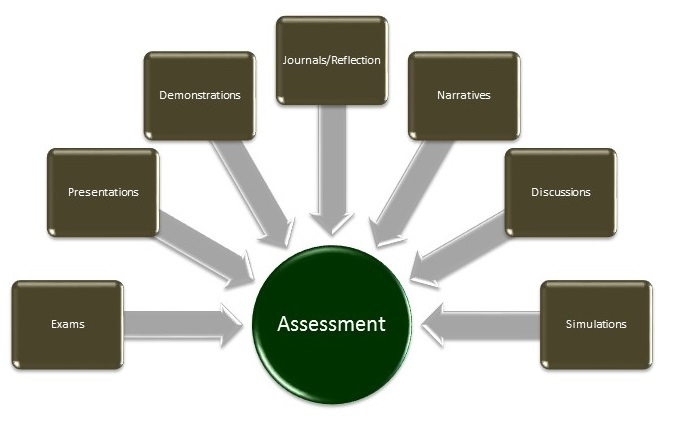 Assessment instruments allow for formative and summative feedback regarding the progressive movement of student learning within the curriculum. Formative assessments measure developmental learning and occurs at multiple instances within a given period of time. Summative assessments are used to measure how much the student has learned over a given period of time. Feedback is an essential component that accompanies both formative and summative assessment and is used as a basis for improvement. It informs the learner about their progressive or summative progress. Feedback can be written, verbal or interactive, as shown through demonstration. Feedback is gathered through faculty review, as well as self-reflection throughout the pre-clinical curriculum and electives, and at midpoint and end of clerkship rotations within the college curriculum. Students are also assessed on the Educational Program Objectives (EPOs) within the six competency domains of Medical Knowledge, Patient Care, Professionalism, Interpersonal and Communication Skills, Critical Appraisal and Quality Improvement, and Societal Awareness and Responsiveness. Competency assessment is based on a progressive model targeting student behavior across a developmental continuum. Expectational outcomes are defined by milestones of achievement across each course. Meeting or exceeding expectational performance in all competency areas is required for graduation. Samples of the assessment tools used to assess student performance across competencies can be seen in both the MS1 CBI Assessment (PDF) and MS2 CBI Assessment (PDF) forms.